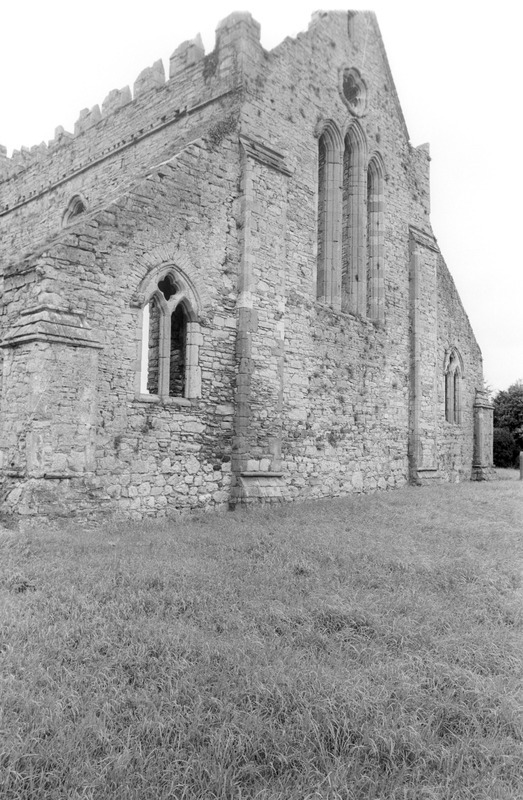 “St Mary's Collegiate Church, Gowran, Co Kilkenny, exterior - nave, west gable, north and south aisles,” Gothic Past, accessed April 20, 2019, http://gothicpast.com/items/show/1196. Photograph by Roger Stalley. North and south aisles and west gable of the nave seen from the north - west. Gable elevation has triple lancet and rose windows; aisle elevations have twin lancets with quatrefoil window overhead surmounted by hood moulding with head carved label stops. Buttresses on nave elevation at junction with aisles and at corners of aisles. North elevation of nave arcade has battlements. North aisle window shows hood moulding with head carved label stops.